Statue of Unity is a statue of Sardar Vallabhbhai Patel, Who is also known as India’s founding father. This statue is the world’s largest statue. 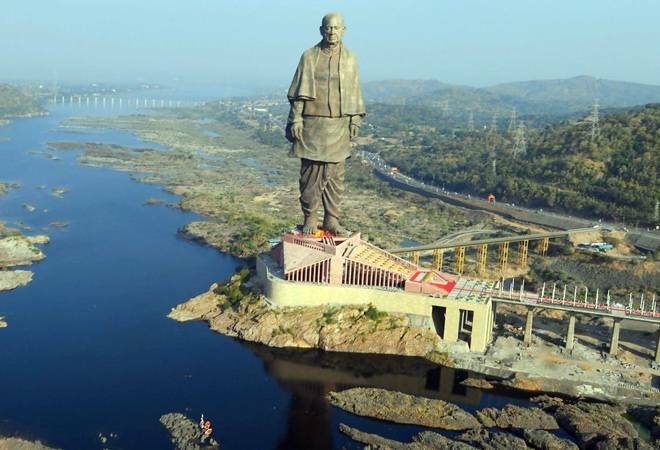 Its height is 182 meters and this statue is situated in Gujrat in Narmada district. It’s height is double as compared to the statue of liberty. The height of the statue of liberty is 92 meter which is half of the statue of unity. It is also the longest statue as compared to the height of the statue of Buddha (Spring Temple Buddha) in China. The statue is situated on Narmada river island on Narmada Dam. This statue is built by Larsen & Toubro. The contract of designing, maintenance is given to Larsen & Toubro in October 2014 for the amount of Rs. 2989 crore. The work of development of this statue is completed in October 2018. To complete the work of this statue 250 Engineers and 3400 laborers worked on this project to construct the world’s largest statue. This statue is inaugurated by the Indian Prime Minister Narendra Modi on 31st October 143rd anniversary of Sardar Vallabhbhai Patel. The statue of Unity was completed within 34 months. In this statue Sardar Vallabhbhai Patel wearing a traditional dhoti and shawl. How the Statue of Unity is Built? If we talk about the materials used in this statue. It is built by using 22,500,000 Kgs of cement, 1700 metric tonnes of bronze, 18500 tonnes of reinforced steel. This statue is built by Padma Bhushan recipient sculptor Ram V Sutar and work of bronze cladding is done by the Chinese company. Padma Shree and Padma Bhushan recipient Ram V Sutar have also created the Mahatma Gandhi statue at the Indian parliament. The total height of this statue is 208 meter including 58 meters base and 182-meter statue. When Rs. 200 crores allotted to built this statue in 2014-15 then several people and political parties criticized this expenditure. Local tribals also criticized for land acquisition for the Government. The government offered cash and land compensation to the people for the acquisition of land and also govt. provided employment to those people. This statue is becoming the center of attraction for tourist due to its surrounding environment. The statue is surrounded by the beautiful valley of flowers, where 100’s of flower varieties are present. Tourists can also enjoy the beauty and healthy environment of this valley. There is a lift inside the statue to reach in the heart of Sardar Vallabhbhai from where we can see the view of the valley. This was all about the Statue of Unity and I am sure after reading this everyone will think to see this statue.